The slowly growing mountain gorilla population is one of the conservation success stories of our time and a gorilla tracking safari is a highly rewarding experience. 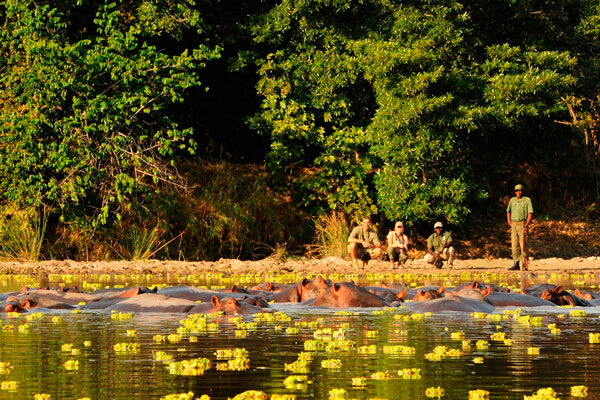 The only way to find these jungle kings is on foot, with a guide and a team of scouts. 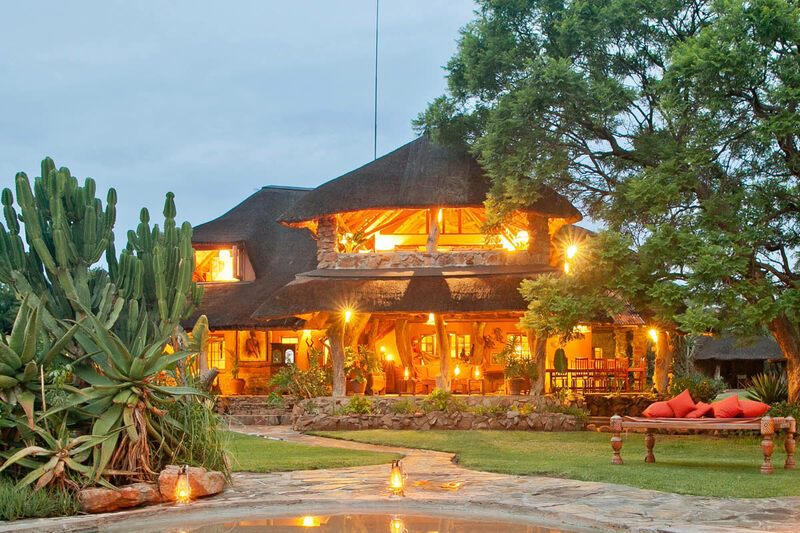 If you are looking for a breath taking experience (and not just because of the altitude), then this is the one; meeting some of our closest relatives in their home environment is mother-nature at her very best. 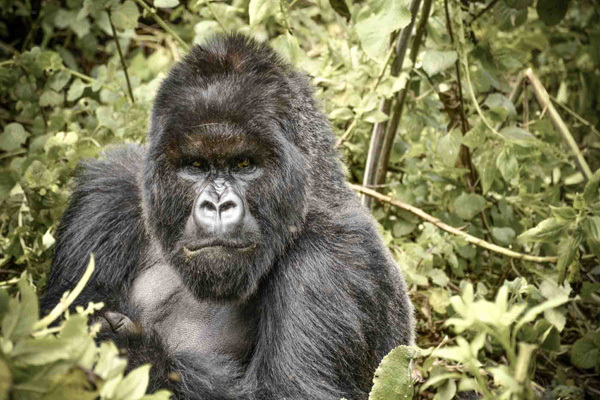 I have been lucky enough to see mountain gorillas in Rwanda and Uganda, and also the western lowland gorilla in Congo. I would recommend all three experiences as they are so different to each other. 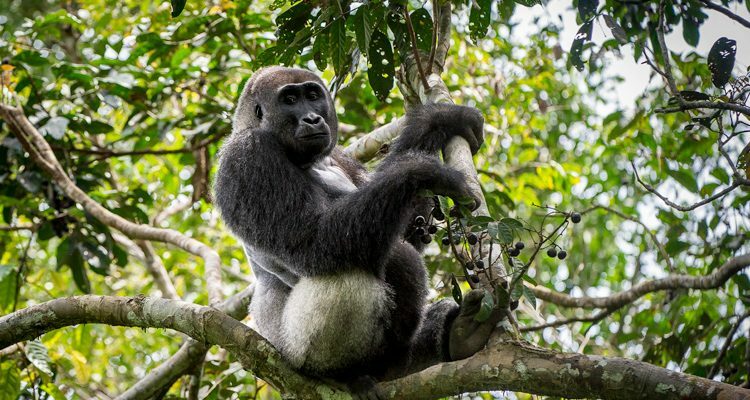 Bwindi Impenetrable Forest in the far west of Uganda is home to over half the world’s wild mountain gorillas, and there are currently seven habituated gorilla families here. 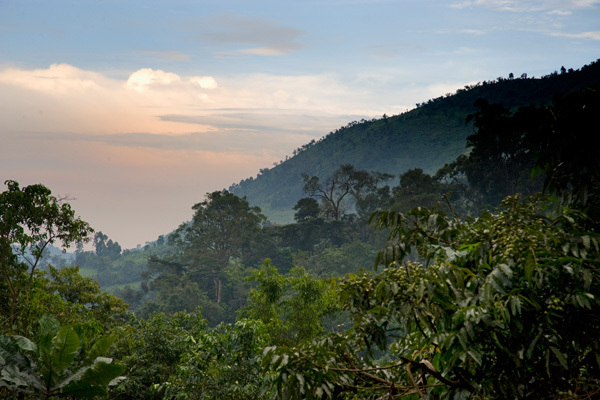 Bwindi is also home to 93 mammal species, including 11 different primates, and almost 350 bird species. 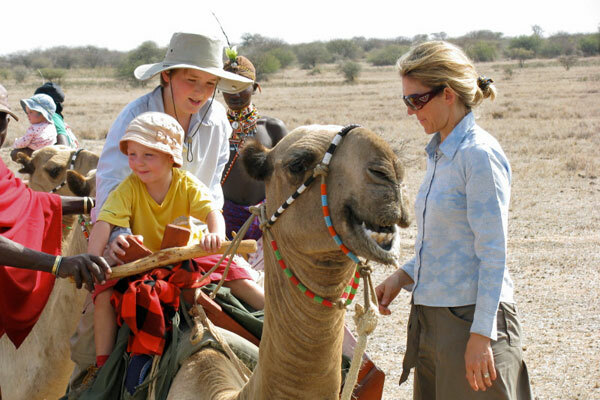 This wonderfully varied wildlife can be viewed on walks of various lengths, alongside knowledgeable national park guides. 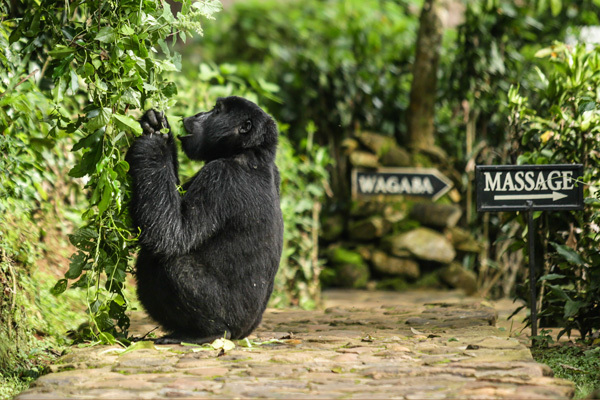 There is a general feeling that gorillas in Uganda are harder to find than those in Rwanda but as ever with the natural world, that’s not always the case. We have had guests who met them at the park entrance and didn’t walk at all. 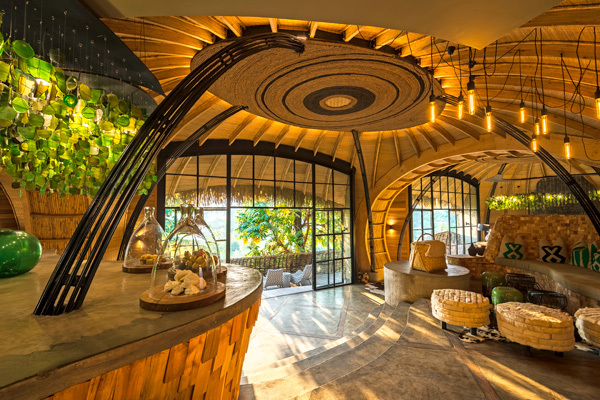 Another lucky guest in Uganda had this experience in the lodge; an extraordinary encounter with mountain gorillas, captured on video. 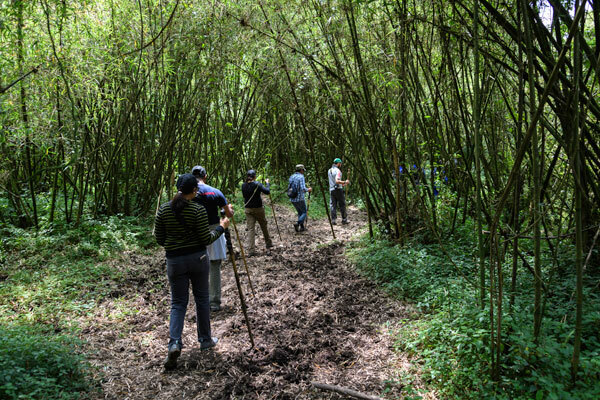 Generally though you can expect to walk between four and five hours on a day’s trekking and while the aim is to find the gorillas (and 98% of treks are successful), there is so much more to see on the way. In Rwanda, the gorillas are found in Volcanoes National Park, part of the Virunga mountain range (which spans Uganda, Rwanda and Congo), in the north of the country. There are currently 10 habituated families here. The vegetation is thinner, allowing particularly stunning views, and the ground not quite as steep as in Uganda which is why the tracking here is considered slightly easier. Whether you choose Rwanda or Uganda, you should be prepared for some tough walking, on steep paths that can be slippery when wet. We recommend sturdy boots or walking shoes and to wear gardening gloves so that you can grab branches without worrying about what you are grabbing. 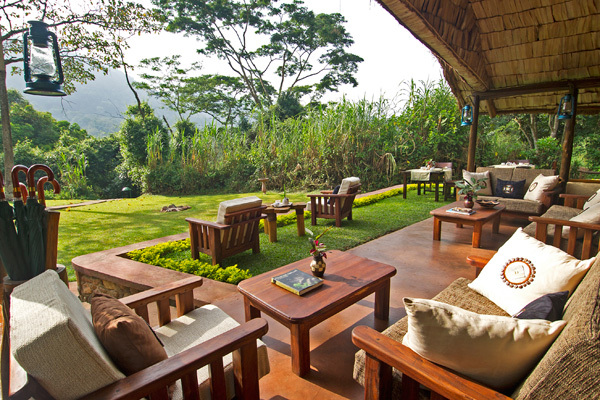 Once you find the gorillas it’s a calm and gentle experience. You stop in your tracks and don’t invade their space – they definitely don’t live by the same rules though and will come fairly close to you. Meeting them face to face is one of (if not the) best things I have ever done in my life. Trekking western lowland gorillas in the forests to the north of Brazzaville in Republic of Congo, is a very different experience. They spend more time on the move and are quick, acting more like chimpanzees than their mountain cousins. They even look a little more like chimps, with brown coats and ginger chests, less imposing perhaps but seemingly more inquisitive. For their bulk – they’re smaller than the mountain gorillas but still sizeable – they are incredibly agile, climbing trees and crossing the forest with ease. It’s when you find the lowland gorilla that the pace picks up as you are viewing them on the move. For me, the fact that you work harder to see them and don’t get so close makes the experience all the more rewarding. For a truly special gorilla experience, consider signing up for a gorilla habituation trek in Uganda. 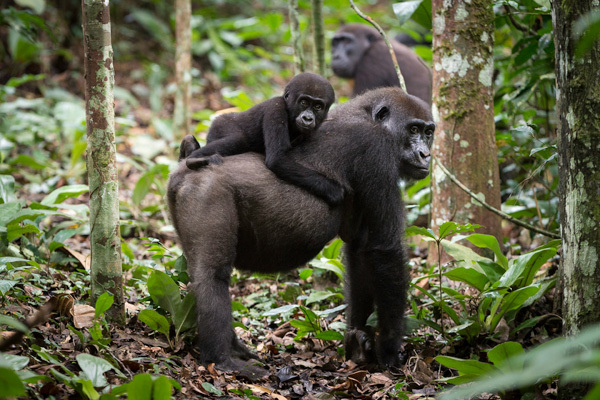 Habituation is the process of familiarising gorillas with people and involves trackers, conservationists, researchers and rangers approaching gorillas and spending time with them. The whole process takes around two to three years to complete. 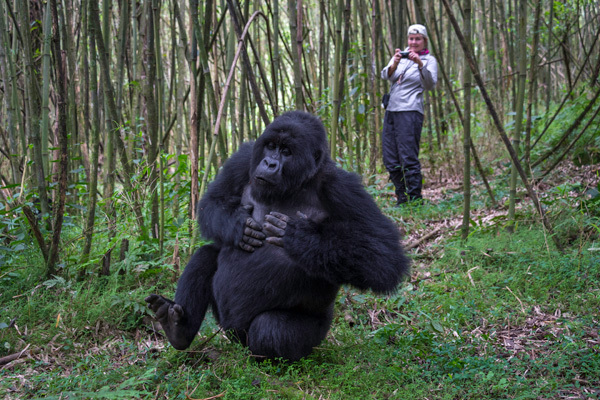 Just four visitors are allowed to join trackers and researchers on the Uganda habituation experience and can expect to spend much more time with mountain gorillas than is normal on a standard gorilla track. Currently only one of the 17 groups of gorillas is available for a habituation experience – it’s something still very much on my bucket list. One last thing, for the very select and lucky few, is to take part in the gorilla census. Carried out every five years, this counts all the gorillas from non-habituated groups as well as checking over 1,000 sq miles of dense forest. The last one (May 2018) showed that their numbers have reached over 1,000, for the first time in decades, something that every traveller who has had the pleasure of seeing these great apes should be very proud of. The next census will be conducted in 2023. I am interested in a gorilla trek probably in Uganda. I’d be a single traveler. 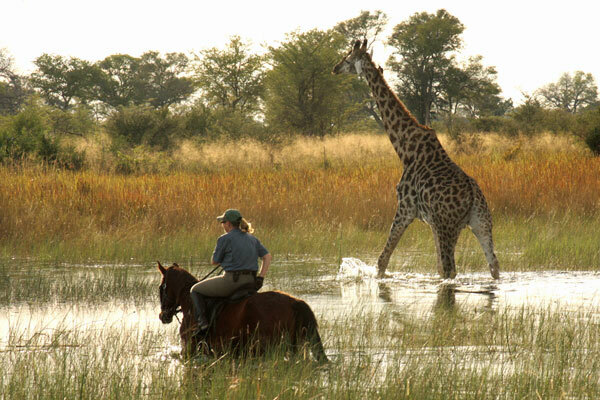 I’m quite a fit 69 year old and went on your horseback safari in the Okavango last summer.